So, in theory, if I can find HCAN somewhere, I can still connect it in? Not necessarily. Just because that data line may exist in the car doesn't mean that the signals that we're looking for are present on those data lines. What specific messages are you looking for? Universal diagnostic messages. If the wires aren't present at the OBD2, then those messages definitely won't be there. I'm trying to figure out if parking brake and reverse signal should be coming from the iDatalink Maestro RR on my install in an 06 Toyota Sienna limited. The factory unit with navigation certainly knew when it was in reverse because it auto-switched to the factory backup camera. I would think there would be reverse signal wiring to the stereo. 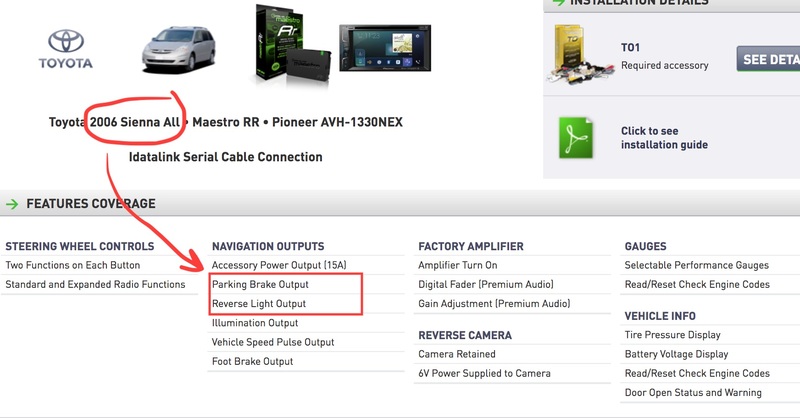 After connecting everything (I believe correctly) I get no reverse or parking brake signal. The website says both are supported when selecting the product. We have seen older Siennas where the parking brake and reverse signals are not present on the data lines. When this happens, you will not have an output from the RR. There is a diagnostic menu in the OEM Setup menu of the radio that can help determine if this is the case. Go to OEM Setup > Maestro Module > Diagnostics > Inputs and Outputs and see if the gear position and parking brake status are N/A, or if they actually give a readout. Thanks for the quick reply. I'll take a look and post back. Yeah, looks like I'm getting an ODB2 communication error. Does this mean the Maestro won't have any of diagnostic features as well as the backup and reverse signals and I'll have to hardwire that functionality? That is correct. If we are unable to get can signals from the vehicle, those features will be missing.